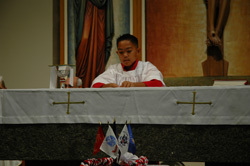 Sunday: The altar servers assist the clergy during the celebration of the Mass. Ages second grade and up, and who have received their First Holy Communion are welcome! 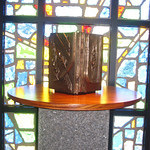 Weekday: Weekday sacristans and altar servers are called to serve the Lord in His altar of sacrafice by preparing the credence table and the altar for daily Mass. They also assist the priest during Eucharistic Exposition and Benediction. "Do not let your hearts be troubled." (John 14:1 a) The St. John's Bereavement Ministry members help by assisting in the planning of a Funeral Mass and serve as Altar Servers, Ushers, EMHCs (Extraordinary Ministers of Holy Communion), Lectors, etc. They are at the Mass to comfort and console the family with their prayers, as well to serve in this ministry. 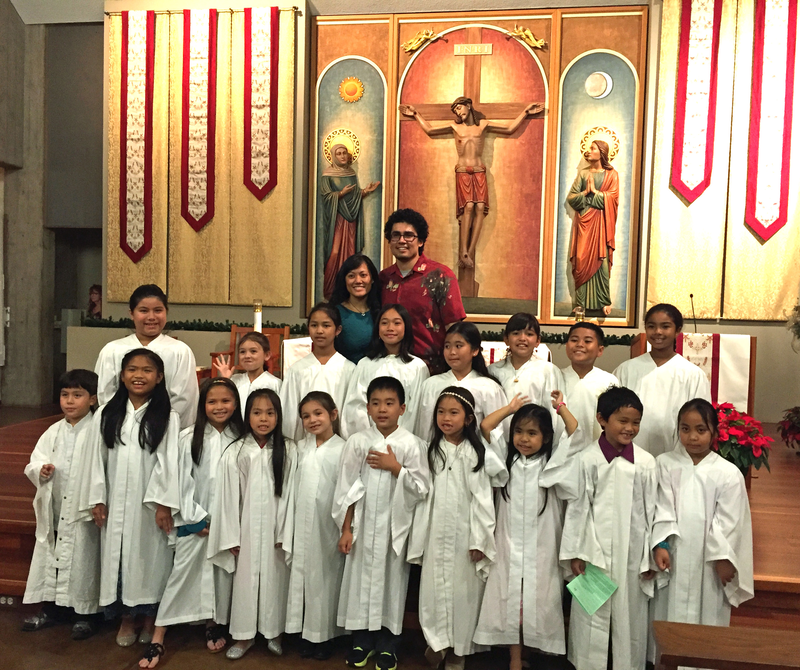 The St. John Apostle & Evangelist Children's Choir is an exciting opportunity for young singers in grades 2-8 to unite in God's gift of song and prayer. 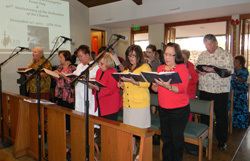 With weekly rehearsals, they are guided with spiritual formation as they develop an understanding of their important role as dedicated music ministers within the sacred Mass along with their musicianship and choral techniques. We are committed to teaching the beauty and meaning of the word and prayer in every song, serving the Lord and the community. They participate in the Mass once a month, during special Masses throughout the year, and other opportunities. We encourage the children to give their best work to the glory of God, which requires a faithful presence in the rehearsal room each week. We want them to grow in their faith as good stewards and learn to lead others to do the same. Choir practices is held on Tuesdays, 5:30 pm -6:15 pm in the Church. The three most sacred areas of the church (Sacristy, Sanctuary, and Chapel) are cleaned by five different groups of dedicated women and men. These special people share their time, talent, and treasure once each week every month in keeping the Lord's house clean and beautiful. The Disability Team focuses on ensuring our parish facilitates and services are accessible and welcoming to the disabled and those with mobility issues. Additionally, the Disability Team educates and provides input to our parish and community on disability and mobility issues. The Liturgical Environment Ministry enhances our worship space for Mass and liturgical celebrations. They also sweet and mop the floors twice a week, Tuesdays and Fridays after the 8 a.m. Mass. Help the clergy in the distribution of the Body & Blood of Christ with care and reverence. The Global Outreach Team helps our parish serve the needs of those outside the USA (i.e., South Sudan, Cameroon, Nigeria, Holy Land, etc.) St John's has always supported our brothers and sisters in faith outside the United States, but the Global Outreach Team has an opportunity to improve our knowledge of the needs and coordinate our parish's support- this team will really make a difference to Catholics worldwide. Extraordinary Ministers of the Holy Communion to the sick and homebound of our parish visit hospitals or homes representing the love and compassion of Christ from our parish community. Born in response to Bishop Larry Silva’s call to support Molokai’s emergency needs after the shutdown of Molokai Ranch (which left hundreds unemployed), the Hui encourages parishioners to support its efforts provide assistance to the needy in Molokai with items such as food, clothing, school supplies, and toys. The Hui aslo assists the efforts of the Outreach Program. Major annual projects include: providing food for the neediest elementary school children by providing food backpacks on weekends, Thanksgiving food certificates to families, and toys for the needy children on Molokai at Christmas. Meetings are on the first Wednesdays of each month from 9-10 am in Room 5. Kupuna Kokua is a pilot ministry for the elderly in the diocese, in collaboration with the City and County of Honolulu's Retired Senior Volunteer Program. This ministry helps the elderly, who are at risk of eviction from government-subsidized housing, with household chores to ensure passing their evaluations and inspections. In this way, they are able to keep their homes and avoid becoming homeless. 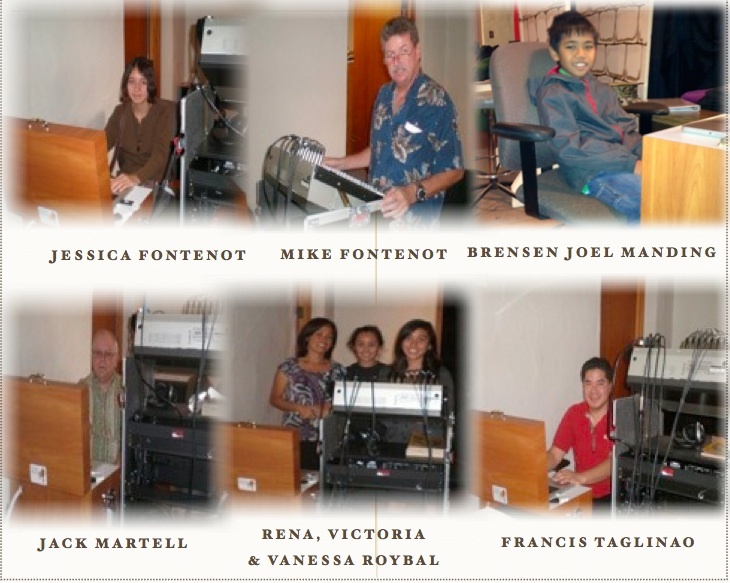 We also share this ministry with Our Lady of Sorrows Church, Wahiawa. Serving only those who live in affordable senior housing. The Laundry Ministry serves to keep the clergy chasubles/stoles, altar servers' cassocks, and altar lines fresh and clean. 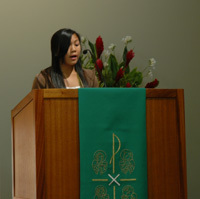 Lectors prepare and proclaim the Word of God at Mass and other liturgical celebrations. Provides a balanced dinner meal for 375-400 plus individuals who are homeless or being sheltered and fed at IHS (on a monthly basis) the second Friday of each month. Food is purchased and delivered to IHS for their kitchen staff to prepare. Meal is served by volunteers from various ministries/organizations from St. John Apostle & Evangelist Catholic Church. The Money Counter Ministry's function is to count, record, and deposit the Sunday collections and special collections of any kind. 'Come, let us sing with join to the Lord, let us shout aloud to the rock of our salvation.' (Psalm 95:1) Do you feel the call to sing? To share your musical talents and be a part of a growing music ministry? We are called to enhance our worship, unify our parish family and bring the best of ourselves in song and prayer. Choir practices held once a week. Outreach is available to help the less fortunate and hurting by reaching out and touching others with caring, compassion and understanding. Assistance is provided with clothing, household goods, and financial assistance (limited). Nonperishable food items are provided from our Food Pantry for those in need. Provides Parish Prayer Line service, school supplies, and Holiday Food and Fund Drive for the less fortunate. Parish Health Ministry is committed to engaging its members and our divers communities to develop and provide excellent health service through education and science as the vehicles to enrich and enhance parishoners and their environment to achieve our mission and vision. Calendar of events include: monthly blood pressure screening and counseling, providing at least two workshops/seminars a year, BLS certification every two years, Parish Health Fair every every, nutrition demonstration, flu vaccine every year, and publication of healthcare tips in the church bulletin every month. Meetings are on fourth Saturday of each month. Luncheon meetings are held quarterly. The Senior Adult Ministry Team focuses on those 60 and older and offers activities that foster spiritual growth and health, aged-level educational pursuits, evangelistic outreach, and wholesome fellowship events. In partnership with Catholic Charities Hawaii, the Senior Adult Ministry Team visits the elderly and escorts seniors to medical appointments and shopping trips. This is a new ministry at St. John Apostle & Evangelist. If you are interested in being a part of the Seniors Team, we can use your help! The Social Justice Team is a brand new initiative designed to provide insight and information on social justice issues important to our parish, our country, our world, and our church. The Social Justice Team is a catalyst and educator in highlighting current social issues in accordance with the key principles of Catholic Social Teaching. Greet and assist parishioners and visitors in finding seats, take up collection, and serve the worshipping community with joy, kindness, dependability and creating a quiet & reverent atmosphere within the church.